Case School of Music is bringing their school of quality music instruction to people around the world! Case School of Music is offering live interactive music lessons customized to each individual student's needs over the internet for students unable to make it to Case School of Music. Quality instruction is delivered via Facebook Messenger (or comparable video message platform) and the school's lesson notes software. Specialized packages or weekly lessons are available. Lessons are scheduled at yours and your teacher's convenience. You may sign up below. A 4 half-hour lesson package to help students prepare for All State Band auditions in percussion. Study with a highly reputable percussion instructor who has placed numerous students in All State Band over the past 15 years. This package cost is $100 plus any applicable tax. A 4 half-hour lesson package to help students prepare for All State Jazz Band auditions on drumset, guitar, or bass. Study with highly reputable instructors who have placed numerous students in All State Jazz Band over the past 15 years. This package cost is $100 plus any applicable tax. Please specify which online lessons you are signing up for. Learn rhythm comping with real jazz guitar chords, how to solo, and how to read notes in two different neck positions on guitar. Study with a ﻿highly reputable instructor who has placed numerous students in All State Jazz Bands over the past 15 years. These lessons are weekly half-hour lessons delivered via a combination of Facebook Messenger (or comparable video message platform) and the school's lesson notes software. Lessons are customized for individual students. Minimum lesson commitment of one month (4 half-hour lessons). Monthly tuition is $100 plus applicable tax. 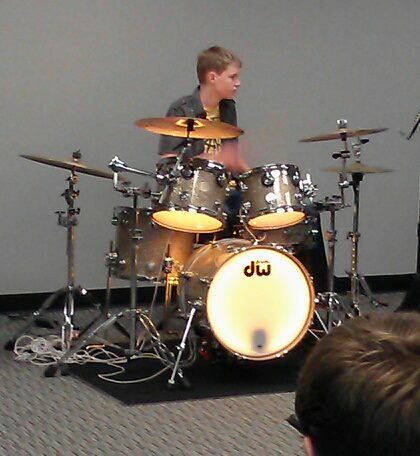 Work with one of our drumset or percussion instructors live online. These lessons are weekly half-hour lessons delivered via a combination of Facebook Messenger (or comparable video message platform) and the school's lesson notes software. Lessons are customized for individual students. Minimum lesson commitment of one month (4 half-hour lessons). Monthly tuition is $100 plus applicable tax. Learn how to build walking bass lines, solo, play Latin styles, and read notes in 2 different neck positions. Study with a ﻿highly reputable instructor who has placed numerous students in All State Jazz Bands over the past 15 years. These lessons are weekly half-hour lessons delivered via a combination of Facebook Messenger (or comparable video message platform)﻿ and the school's lesson notes software. Lessons are customized for individual students. Minimum lesson commitment of one month (4 half-hour lessons). Monthly tuition is $100 plus applicable tax. ﻿Learn to play a group of 6 open position chords playing 5-6 strings from the beginning! The first lesson you should be able to play 3-4 songs using this method.